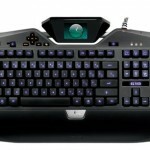 The Logitech G19 is packed with features including a tiltable color LCD called the GamePanel that sports a resolution of 320 x 240. The keys are backlit and the user can choose which keys are lit and which aren’t for a completely custom layout in a dark environment. 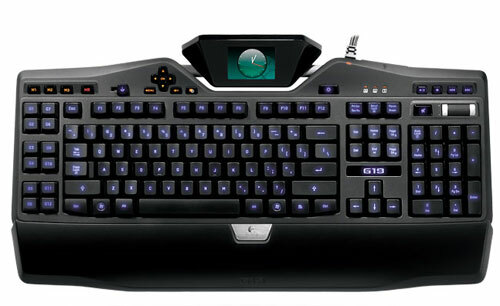 Logitech designed the G19 so that it could accept input from five keys simultaneously. Like previous generation G-series gaming keyboards, the G19 has 12 fully programmable G-keys that can be bound to macros recorded in game. On the top edge of the keyboard are two powered USB ports and the underside of the keyboard has a cable management systems. One touch media access controls are also integrated into the design. 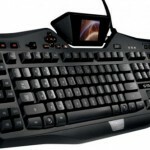 One of the key aspects to any keyboard, gaming or normal, is typing feel. If the keys are mushy and offer poor tactile feedback the keyboard really isn’t good for much of anything. If you have used the other Logitech G-series keyboards before you know exactly what the typing feel of the Logitech G19 is like. Close your eyes and type on both the G19 and the G15 and you won’t be able to tell the two apart without looking. Typing feel for those who have never used a G-series keyboard is good. The Logitech G19 is certainly not the best keyboard for typing that Logitech makes, but it offers nice tactile feedback. A slight click with each key press is great for touch typists and not too annoying after hours of use and the keys are sized well. You could use the Logitech G19 for daily computer work easily with the typing feel it offers. Macro recording is straightforward and can be done in game by pressing the MR button, selecting the key you want to use and then hitting the keys for your macro. 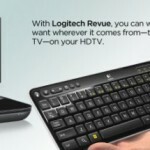 The programming is just like what Logitech has been doing on its other G-series keyboards for years and works very well. Backlighting on the G19 is uniform and bright enough for the darkest environments. You can adjust the backlighting in the software to determine what keys glow and which keys don’t. The coolest feature is the LCD display, which is also one of the downsides of the keyboard. The LCD has surprisingly good image quality and you can watch video from sites like YouTube with no smearing, tearing, or other major issues with playback. However, the LCD requires its own power supply. If the outlets around your desk are as in demand as mine are that can be an issue. The screen can show stats from compatible games to give you an at a glance view of hit points and more game information. Honestly, I never liked using the LCD of my G15 for game data; I didn’t like taking my eyes off the game to check when the stats were typically right on the screen anyway. The only thing other than the extra power adapter I can say about the Logitech G19 is that the thing is downright expensive at $199.